This will be the last news post for March. I’ll be working on getting the April Escapist Newsletter organized so I can post it by the 1st. Authors: if you have anything you would like me to mention, please don’t hestitate to leave a comment below or anywhere else I am – email, facebook or twitter. Now on to the news…I am a huge fan of Diana Pharaoh Francis’ urban fantasy series, the Horngate Witches, so I’m really looking forward to jumping into her fantasy Crosspointe series. 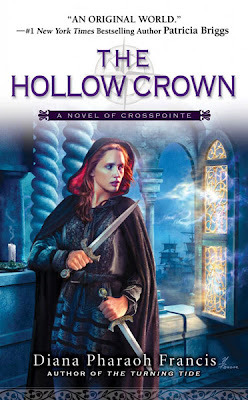 The fourth novel, The Hollow Crown, has a new snazzy cover and releases June 1, 2010. SciFiGuy also has the previous three novel covers and they all look pretty amazing. For two weeks beginning on April 6th, Wicked Lovely, the original gritty tale of faery intrigue, mortal love, and the battle between Summer sun and Winter ice, will be available online for FREE. Don’t miss Stopping Time, the exciting original sequel to Ink Exchange, now available as a two-part e-book. Click here for details and to download. Melissa Marr had a movie update for us. She’s seen the screenplay! Right there tells me that we’re going to be getting the movie soon. According to Melissa, the writers did an amazing job conveying the story to the screen and even made a few improvements. They are also on schedule with the production. Next up is finding a director and cast, so no release date yet, but it’s closer. There’s a new cover for Sherrilyn Kenyon’s first YA novel, Infinity, the first novel in the Chronicles of Nick. Why did I think this was released in February? I don’t know, but I kind of like the change, which is the addition of Nick on the cover (or I assume who is Nick). It’s not as close to the Dark-Hunter novels that have been coming out lately, but you can still tell it takes part in the Dark-Hunter world. Thanks to Dark Faerie Tales for noticing this. Infinity releases June 1st. Congratulations Kelly Gay, Eileen Wilks, JR Ward, Marjorie Liu and Kresley Cole for their RITA nominations! To see the complete 2010 Rita Finalist list, click here. All Things Urban Fantasy has found Patricia Brigg’s tour dates for Silver Borne. Unfortunately, she’s not coming anywhere near Michigan, which means I’m sad. Make sure you her schedule if you want to see her and you live west of the Mississippi. A Booklover’s Review has a great new contest going on that’s going to have 23 different prizes given out over the course of 23 weeks with 2 grand prizes that includes a lot of stuff. Rachel Vincent is one of the authors participating, so make sure you head over and check out to see what’s being given away. SciFiGuy is giving away a copy of Charles de Lint’s The Mystery of Grace. Contest ends March 31st. Literary Escapism is giving away a copy of Trularin’s The Last Map to the Throne of God. Contest ends March 31st. Naughty Editions is giving away a copy of JR Ward’s Covet and a copy of Larissa Ione’s Ecstasy Unveiled. Both contests end soon. Last Map to the Throne of God Contest! I’m glad to hear that there’s another big fan of Diana Pharaoh Francis’ book, Bitter Night. I loved it, and I don’t think it gets enough props. I’ve been meaning to try her other series for a while now, and those fantasy/nautical covers are gorgeous.